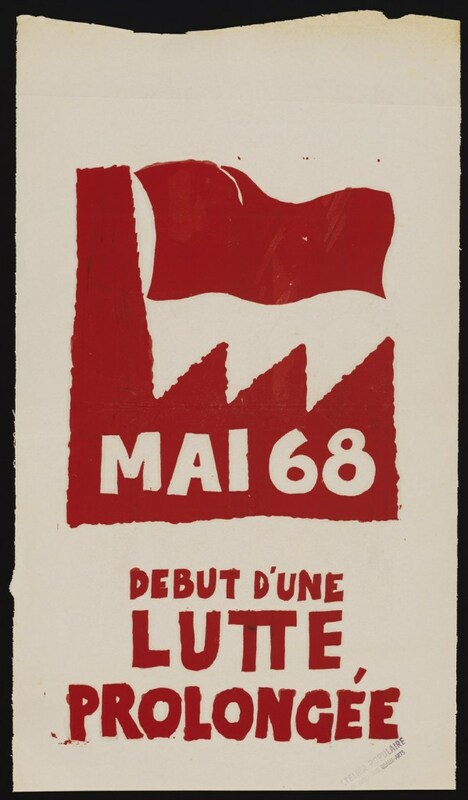 Les evenements de mai 68 are now fifty years old. Yet their profound and revolutionary effect on French society and radicals in advanced capitalist nations are still being felt, and of course, with the 50th anniversary in 2018, there is a small flurry of reminiscent articles even in the mainstream media. True, much of l'esprit de '68is is built around a sense of utopian, creative, and imaginative euphoria, with the science fiction novel by Lisa Goldstein, The Dream Years, an illustrative example. On the other hand there was particularly earthy and challenging cinema from the new wave greats in cinema; Jean-Luc Goddard's ironically titled Tout Va Bien and Bernardo Bertolucci's The Dreamers. As much as these artistic endeavour both inspire and challenge however, it is primarily from documentation at the time that the most functional lessons can be learned; in particular, the French-language Journal de la commune étudiante and the English translations in Writing on the Wall. Situations have a context, and the situation in France in 1968 was at a breaking point. The rule of de Gaulle as president and Pompidou as prime minister had reached a point of near-parody in grandiosity (de Gaulle) and ennui (Pompidou). In the immediate post-war environment, there had been radical hopes which were soon sidelined and the Fourth Republic had come to a sudden and eventful collapse as nationalists in the army rebelled against the government's policy of a negotiated settlement in Algeria and threatened a coup against the government. Whilst the economic policy of dirigisme had assisted in the post-war recovery, and de Gaulle's nationalism ensured France as an independent world power, especially after developing it's own nuclear capability. Demographic changes had led to a significant increase in the student population of France in an environment that still expected social conservatism. The traditional French countryside had been abandoned in favour of the expansion of modern industry, yet the economic security of the French working class was dubious at best, despite what would be called Trente Glorieuses by Jean Fourastié. Whilst this had some reflection in political results (the "presidential" parties only had a one-seat majority in the 1967 elections) the next legislative elections were some time away. Needless to say, it was also the 1960s. This was a tumultuous period where civil rights and various forms of social and political radicalism clashed with cultural conservatism and political violence. It was as much in the context of foreign intervention and conscription to the Vietnam War, as it was with the Prague Spring initiated by reform communists like Alexander Dubček, as it was to the civil and economic rights campaigns of Martin Luther King Jnr, as it was with the cultural criticism expressed through a Freud-Marx synthesis by members of the Frankfurt school, such as Herbert Marcuse. The famous origins of les evenements was the occupation of the administration building at Paris University at Nanterre by students protesting against university funding mechanisms and class discrimination. In response, the university called the police but the protesters were able to leave without incident. However the protests continued, and several weeks later, on May 2, the administration shut down the university with support of the police. Four days later riots erupted as student congregations led to hundreds of arrests. As the national student union and the union of university teachers were organising protests against the police invasion of Sorbonne, a ban was placed on demonstrations in central Paris. When some 50,000 students and teachers marched on Sorbonne, they were attacked by police, who in turn found that the protestors received support from local residents, erecting barricades. The following day high school student unions joined, and by May 10th and through to the following day, there were riots and barricades on the Rive Gauche, with hundreds of arrests. Student protests and strikes are, of course, limited by their position in the relations of production. A massive turning point in the protests came when two major labour union groups, the Confédération Générale du Travail (CGT) and the Force Ouvrière (CGT-FO), called a one-day general strike and demonstration for Monday, May 13. When over a million people marched through Paris that day; the police did not intervene this time. The Prime Minister Georges Pompidou announced the release of those arrested and the re-opening of the Sorbonne, certainly hoping that would lead to the end of the strikes and protests. Instead, they increased. Students and teachers occupied the Sorbonne and declared it an autonomous "people's university", and over 400 "popular action committees" were established in Paris. Factory occupations increased to fifty by May 16, and by May 20 almost ten million workers - about two-thirds of the French workforce - was on strike. The mainstream union leadership, including the Communist Party, tried to channel the worker's protests into demands for higher wages (such as a 35% increase in the minimum wage), which was rejected by the workers who sought to bring down the government. On May 28, François Mitterrand of the Federation of the Democratic and Socialist Left declared that "there is no more state" and offered to form a new government. The following day former Prime Minister Pierre Mendès France of the Radical Party, offered the same and unlike Mitterrand he would include the Communist Party. Famously, President de Gaulle, fled the country, going to the French military base in Baden-Baden, Germany. The day after that, approximately 500,000 protesters led by the CGT marched in Paris celebrating de Gaulle's departure. Yet on the same day Pompidou persuaded de Gaulle to dissolve the National Assembly and call a new election; some 800,000 supporters of de Gaulle marched in Paris in support of the President. With impending new elections, a conservative response gained momentum. The left was split politically, and the most revolutionary groups were banned. The existing strikes and occupations largely collapsed, and the Sorbonne was retaken by police. In the two-round elections of June 23 and June 30, after months of protests and rioting, voters chose the stability knew over an uncertain revolution. The conservative Union of Democrats for the Republic (UDR), improved their position by 111 seats, increasing their tally to 354 of a total of 487 in the National Assembly. The Socialists lost over half their seats, dropping 60 to 57, and the Communists too, losing 39 seats to 34. It was a devasting loss to the left, who would lose Assembly subsequent Assembly elections in 1973 and 1978, finally winning a majority of seats in 1981, just after Mitterand was elected President. There were some changes of course; the workers did receive the wage increases promised in the Grenelle Agreements, with a 35% increase in the minimum wage and 10% increase in real wages. The students received what they had initially demanded, with structural changes to governance, curriculum, and funding. When de Gaulle attempted to force through government decentralisation and changes to the Senate in a referendum in April 1969, he threatened to resign if it was not carried. It was defeated with 52.4% of the electorate voting against the changes. Thus, even the political objective of getting rid of de Gaulle was a success, several months later, and an ironic twist to his scatalogical pun at the time, "la réforme oui, la chienlit non". As mentioned much as made of the imaginative and cultural side of les evenements, and to a degree this must be expected. After all, what other revolutionary period would find itself memorised by such witty slogans as Soyez réalistes, demandez l'impossible, and Je suis Marxiste - tendance Groucho.? Witty slogans can suggest a cultural shift - but not necessarily a social change, a change to political economy. For that example, one even needs to go beyond the Action Committees, valuable as these were as an idea's fest combined with grievance committee. The real power of les evenements was the realisation among working people is that they actually wielded a great deal of power and, if they wanted to, could essentially completely put the breaks on production - or even more importantly, continue to run matters without the boss. This is of course, exactly what happened with the Besançon-based LIP watch and clock company several years later. As the company floundered financially, an attempted factory shutdown was rejected by the workers who occupied the factory in 1973, and continued production, declaring it a worker-owned firm. There were numerous legal and political wranglings that occurred from that point onwards - which are worthy of a review in their own right, but it does serve as a substantive democratic lesson of les evenements - that people can and should be involved in their role in political economy and, increasingly unlike times past, as production becomes more technical the capacity of working people to manage cooperative firms increases proportionally. In that sense, that free and democratic socialist impetus of les evenements is potentially more likely today than it was in the past - the notion that people can actually manage society without the aid of the managers and apparatchiks appointed by any ruling class. Commenting on this Story will be automatically closed on August 23, 2018.